Here at the Appalachian Trail Conservancy, a day does not go by where we, and our trail management partners, don’t hear about hikers engaged in activities that are not compatible with Trail values. That’s not to say that there aren’t thousands of hikers that are doing the right thing, but more and more it seems to be tipping in the other direction. And as Baxter State Park has called out, it’s time to wrestle this issue to the ground. We need everyone’s help. When I think about inappropriate behavior on the Trail I recall the widely popular and effective anti-littering campaign in the 1980s. This campaign was effective because it depicted the extent of litter across our lands and asked everyone to take a hard look at what they were doing to contribute to the growing problem. Let’s face it, we could all benefit from taking a hard look at how we behave on the Trail. Day hikers, thru-hikers, section hikers all have a responsibility to protect the unique experience of hiking a world-renowned National Scenic Trail. It’s a precious resource that should not be tarnished. Frankly, the last thing I want to hear is that a hiker chooses to hike elsewhere because the Appalachian Trail (A.T.) is no longer the outdoor experience we have all come to revere. Know before you go. The A.T. is unique in that it crosses 14 state borders, eight different national forests, six national park units and numerous state park, forest and game lands. Those lands are all managed for different purposes, which means the way you enjoy those lands will vary. But that’s just part of the A.T. experience! Remember respect. Respect the Trail and those who choose to walk it. It’s just good Trail Karma. Help others make the right decision. With such a large amount of people choosing to visit the A.T., the chances are great that any one of us may inadvertently damage the natural area around the Trail. Brush up on Leave No Trace here, and remind others when necessary. We welcome your ideas and suggestions to promote the good while minimizing the bad. Let us know your ideas by commenting below. View our response to the Baxter State Park Facebook post about this issue here. A flip flop thru-hike is an alternative to the old school definition of a thru-hike. Today’s Appalachian Trail (A.T.) hikers ought to know that thru-hiking the world’s most famous long-distance footpath doesn’t mean they have to start and end in Georgia or Maine. In fact, more and more thru-hikers are finding out that Harpers Ferry is an ideal location to begin or end their hike. The allure of visiting the town twice then tips the scales toward a flip flop hike. Flip flopping visitors get a chance to take some down time not usually afforded to those thru-hikers who are focused on Katahdin and its October 15 summit deadline. Many take advantage of the leisure time to wait for their southbound (SOBO) compatriots and join them in the A.T.’s southern migration from Baxter State Park towards Springer Mountain. 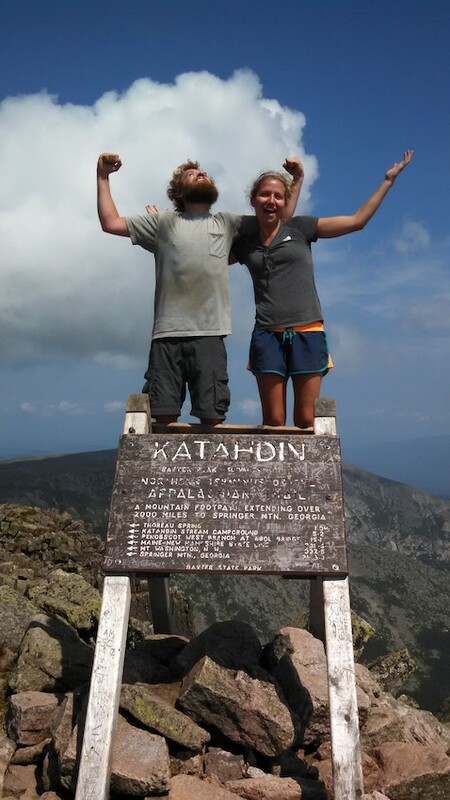 Joseph “Bellows” and Catherine “Watermelon” summit Katahdin during their 2014 flip flop thru-hike. Eighty percent of hikers who set out to complete the entire A.T. in 12 months or less start in Georgia and end in Maine. Talk about a crowd! Flip flopping offers a relief from the large groups of Northbound (NOBO) hikers not only to the flip flopper, but to the Trail itself. The ATC is encouraging this conservation-minded thru-hike. Ryan “Castanada” Seltzer, the ATC Corridor Stewardship Coordinator, is also a FFKO workshop presenter, and after successfully completing a flip flop in 2009, he’s been a flip flop advocate from the start. Who wouldn’t want to soak up as much of the Trail’s beauty as they could? Flip flopping lets you slow down and enjoy more of the little things. “That’s really why people should consider a flip flop hike,” concluded Seltzer. The Flip Flop Kick Off is about more than the awesome temporary tattoos you can get during the festival (whice are seriously cool). It’s about celebrating the men and women, young and old alike, adopting this new version of a thru-hike. We’re gathering to celebrate the traditions of our beloved Trail melding seamlessly with new alternatives that are only going strengthen the A.T. for generations to come. That’s why there’s no doubt in my mind, that the answer to the question, “Is this the start of a new A.T. tradition?” is a resounding YES! For more information about the Flip Flop Kick Off, visit www.appalachiantrail.org/flipflop. Below is a real-life testimonial from two hikers who met using tHarmony, a dating service offered in partnership with the Appalachian Trail Conservancy. To learn more about tHarmony or to sign up to find your Trailmate, visit www.appalachiantrail.org/tharmony. I have hiked with a lot of people over the years—including some guys who became my friends and some who became a little bit more. I have no regrets about those past relationships, though, because they helped mold me into a better backpacker and, ultimately, a better person. This means that by the time Canuck came into my life, I was pretty confident about who I was and what I wanted in a trail (and soul) mate. Coming from a good place emotionally allows me to bring more to the proverbial “tent,” so to speak, and enjoy what Canuck has to offer—both on and off the trail. Canuck and I just fit, and it feels like we’ve been hiking with each other forever. People ask us how long we’ve been together, and it always surprises us to realize it wasn’t too long ago that we met for our first hike near Bear Mountain, New York. We do feel like it took our whole lives to find each other, though, and now we’re sticking together like mac n’ cheese (but not with that pouch of tuna mixed in, because tuna mac is so early 2000s). Thank you, tHarmony, for matching us. I know we couldn’t have done it without you! On Friday, we’ll celebrate our 9-month anniversary, and we figured we ought to give credit where it’s due. To anyone doubting the site, anyone that is tired or having poor luck dating in the hiker community, don’t give up! Dating can be exhausting and hard work, but tHarmony makes it easier. Just keep on waiting for that little bit of magic to come along. Canuck and Happy Hipster live in Bear Mountain, New York, and they hit the Trail together almost every weekend. Canuck still rocks the beard that attracted Happy Hipster to him in the first place. Just what does it take to clean up graffiti at a shelter along the Appalachian Trail? Here’s a firsthand account from a shelter overseer who is not only attempting to clean up the mess, but also stop it permanently. Modern day petroglyphs? Self-expression art? An expected rite of passage? Vandalism? The definition of graffiti depends on who you ask. Prehistoric men and women felt a need to mark caves with drawings of animals or to scrape signs and shapes on rocks. Were these messages for others traveling through the area, or were they sitting out a thunderstorm in a cave, bored? Today we can still see the overwhelming urge that humans have to leave their mark—even along the Appalachian Trail (A.T.). Late last year I was asked by Susie McNelly, the Georgia Appalachian Trail Club overseer at Woods Hole Shelter, to help her haul wood chips. While we were at Woods Hole, she showed me how she was trying to remove the graffiti that was beginning to cover the shelter. As the co-overseer of Georgia’s Springer Mountain Shelter, I was very familiar with graffiti in both the carving and marker forms. I began thinking that since most thru-hikes start at Springer, it is probably the first shelter new hikers see. If they see graffiti all over the shelter left by past hikers they probably assume this is an acceptable and almost expected way of announcing to the world that they were there and where they are going. It’s sort of like a wilderness version of Facebook or Twitter—only this “social media message board” is destructive, at times very vulgar and demeaning, and is in fact a criminal act. I decided that this behavior was not conducive to an enjoyable experience for everyone and decided to try and change the graffiti permissive culture to one aligned with the principles of Leave No Trace. As with any cultural change, it will take education, diligence and most of all time. Thirty years ago smoking in office buildings, restaurants and even hospitals was a completely acceptable behavior, but today, you would not only be stared at and ridiculed but would be subject to a hefty fine. Peer pressure is a very powerful tool. I discussed my graffiti eradication plans with my co-overseer Frank Wright, trail supervisor Marion Mclean and district leader David Stelts, and they all agreed it was a good idea. We wanted Springer to set the bar with hopes that if hikers stopped leaving their mark at Springer it would carry over up the Trail at other shelters. So with the help of my wife Patty, Frank and I waited for a day when the temperature was above 50 degrees and began our project. We decided to first fill in all of the deep carvings with Elmer’s ProBond professional wood filler which is stainable and is approved for exterior use, and if it worked well, to return and take care of the less noticeable carvings. To remove Sharpie writings we used “Goof-Off” and sand paper. We waited a couple of days for the filler to dry (it normally takes 24 hours to dry, but with overnight temps in 20s it took longer) and I went to the tool shed and got a couple of gallons of the original stain used when the shelter was built. We applied the original stain, but since it was transparent, the gray wood filler bled through and it looked worse than the graffiti! But after talking with a professional in the paint and stain department at Lowe’s, Patty and I were able to select a cover stain in a reddish brown color, enabling us to try and match the wood of the shelter and not be as noticeable. Again we waited for a 50+ degree day and went back and sanded the original stain off of the wood filler and then applied the new cover stain. It worked! It not only covered the gray wood filler but was a very close match to the wood. The shelter was returned to her original glory—and instead of looking like an ogre in the woods, she had the warm welcoming glow of a Thomas Kincaid painting offering tired and sore hikers a dry, clean and graffiti-reduced haven. I realize that every time I go to clean the shelter I will have to bring my can of cover stain and wood filler to remove new graffiti. But if we can begin to see a reduction in new graffiti within the first year of this project, it will be an investment that will pay big dividends in the future. Robert J. Collins is the Georgia Appalachian Trail Club co-overseer of section 3.1 (Springer Mountain Summit to FS 42) and got his trail name “Psycho” after years of skydiving and BASE jumping.